Drag and drop page builder: Pav Handlee Bixone is built with the best Opencart page builder that allows you to build professional homepage the ways you want. 50+ Opencart widgets: Over 50 widgets are integrated to the Pav Page Builder to help you build content with ease. Powerful theme control panel: The powerful, intuitive and friendly administration panel with all core features built-in will help you with store configuration and customization easier than ever, no coding skill required. Real time theme customizer tool: Customize theme in your Opencart site in REAL TIME with 100+ predefined parameters. Demo data installation: 1-click to get a replication of our theme demo site on your website with same content, graphics, theme settings & layouts. 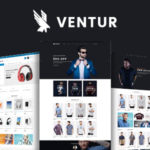 Multiple product page layout: There are up to 6 layouts for product page supported: default layout, accordion, shadow, center, sticky, sticky images. Multiple header and footer styles: supports 5 header and 4 footer styles, switch to any style you want in the theme control panel. 6 ready-to-use demos: The theme is flexible and can adapt multiple shopping cart websites, with 5 pre-made demos, you can select any demo and get it installed on your site using our demo data installation. The Opencart 3 theme includes stunning extensions to build a full functional eCommerce site. Pav Handlee Bixone is fully responsive, SEO friendly and has its own theme control panel with ultimate core features built-in. It is optimized with CSS & JS compression and clean code base to help improve performance of your website.